She finds a nondescript puzzle in the beach house. In a corner of the family room facing the beach she quietly sits down and empties the box. She begins to piece together over one thousand pieces of the puzzle. Intermittently throughout the day she returns to the puzzle methodically identifying piece after piece placing it where it belongs. While many a person would ignore the beach house puzzle, the Puzzle Girl is attracted to this cerebral challenge. Why? What is she thinking while she builds the puzzle? It remains a mystery. After days of puzzle building, she is nearly done. Just blue sky pieces remain. 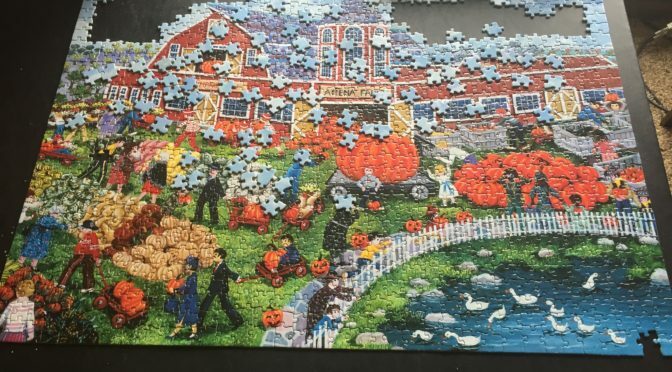 The Arena Farm puzzle seems out-of-place for a beach puzzle with pictures of a pumpkin patch, a barn and a pond. Only 24 hours left at the beach house and under 50 pieces yet to be placed. The real question to be answered is after completion does Puzzle Girl leave the puzzle intact for the next beach house occupant or does she take it apart? A real dilemma. Time will tell. What should she do? What would you do? I would very carefully stare into the completed puzzle picture and contemplate the mysteries of life. #1. Does the silo attached to the barn contain a nuclear tipped missile with CFK’s name on it? #2. Are the cows actually a cleverly disguised Team of Seals & Special Forces on mission to take out CFK? #3. Is the Farm Tractor actually a new piece of military technology destined to South Korea to be used on CFK? #4. Is the farm house actually a military headquarters where our Pacific Allies are formulating their plan of attack with us on CFK? #5. Are those pumpkins actually new military ordinance to be dropped brim our stealth bombers on CFK’s head? Next Next post: Are these Union or Confederate Sabers?